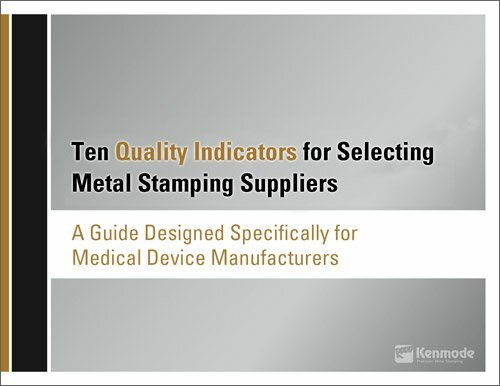 This is the sixth in Kenmode's blog article series entitled "10 Metal Stamping Quality Indicators for Medical Device Manufacturers" to help medical device manufacturers evaluate the level of quality in their metal stamping suppliers. The series will consist of 10 articles, published weekly. Each article will focus on a single quality indicator. 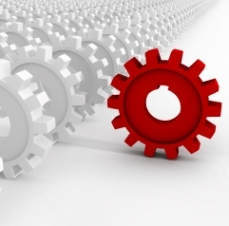 A strong quality system relies on strong prevention and detection activities. Prevention of problems should be the metal stamper’s primary focus, involving both process tools and other methods to prevent defects. The metal stamper should be able to show how their initial capability studies can demonstrate process stability in order to prevent problems down the road. Detection must be an ongoing effort using automated inspection technology and statistical process control to constantly monitor production standards and identify variances as soon as possible. 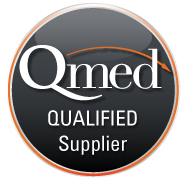 In assessing a precision metal stamping supplier, an OEM should determine whether they have the right processes in place to incorporate quality controls into every phase of a project – from design through shipment – as well as the right technology to monitor quality in real time. The most advanced metal stamping companies are employing the latest technology to ensure that parts production meets quality control requirements and results in zero defects. In evaluating a metal stamping supplier, ask for an overview of the technology in place to ensure manufacturing quality and how frequently that equipment is used. The best metal stampers will continually employ quality control equipment to detect potential problems as quickly as possible, rather than just conduct random testing. Automated inspection equipment, such as in-die sensors and video inspection systems, is critical for ensuring quality. These systems provide instant measurements and transmit records throughout the manufacturing process, which then are charted via the statistical process control system (SPC) to detect variances. Statistical Process Control Systems use statistical methods and procedures, such as control charts, to analyze the inherent variability of the metal stamping process and part production and to track the metal stamping manufacturing process in real time. Important attributes are assigned to the metal stamping along with an acceptable range for variances during manufacturing. Variances from the norm are charted automatically in real time with SPC software, allowing a manager to determine trends and identify when specifications are out of line or an unstable condition occurs which requires further study, and allowing for the quick resolution of any problem. SPC is an efficient process that results in less interruption and process slowdowns than with direct examination and inspection methods. Coordinate Measurement Machines provide precise measurements of the part within the tightest manufacturing tolerances and check geometric dimensions and tolerances specified on the blueprint to ensure that the part meets specifications. Data from the CMM is entered into the SPC system for automatic review of charts in real time so that any necessary adjustments can be made. Optical Vision Systems take non-contact video measurements of all dimensions of the part with resolutions as precise as .000020”. The optical vision system is used to verify initial dimensions to ensure conformance with the blueprint and controls the dimensions required for ongoing production. Data from the vision system is also entered into the SPC system for automatic review of charts in real time so that any necessary adjustments can be made. Functional Gauges and Custom Gauges used to measure parts during manufacturing, from handheld digital gauges to high-tech multi-sensor metrology systems that combine multiple laser and touch probe sensors to perform micromeasurements. Functional gauges match the form, fit and function of a component. When needed, a metal stamper will build a custom gauge for a unique individual part to ensure that measurements meet specifications. In-die Detection Sensor Systems used to protect tools from inadvertent damage due to various mishaps such as slugs, mis-feeds, material variation, etc. In-die sensors can also verify product conformance and ensure quality products at the end of the process.